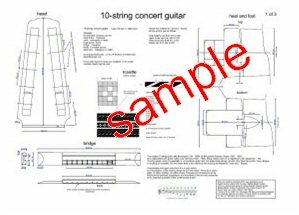 Build a 10 string classical guitar: The ten string guitar was developed in the 1960s by Narciso Yepes who worked with luthier Jose Ramirez to produce a very successful design, and in 1963 Narciso Yepes performed the Concierto de Aranjuez with the Berlin Philharmonic Orchestra, using the ten-string guitar he had invented in collaboration with José Ramírez III, with a tuning designed to supply sympathetic string resonance to all twelve notes of the chromatic scale, in unison with any note played on the treble strings. 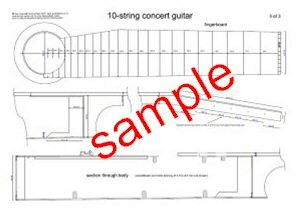 This plan shows in great detail the Yepes style of ten string guitar. From 1963 for the rest of his life, Yepes used only the ten-string guitar in recording and performance. The availability of high-quality ten-string classical guitars from the Ramírez Company allowed and encouraged other performers to investigate the instrument. Six-string guitar music can be played on the first six strings, but with added resonance from the extra strings. This was Yepes' original intention and the reason for the design. Music specifically arranged for the instrument can make use of the extra strings directly, thus: Music originally written for instruments with more than six strings can be more faithfully transcribed. Music written by Bach and his contemporaries for lute is of particular interest in this regard. The bass strings can be appropriately tuned.